You may be surprised to read this announcement, but no stress, take a deep breath, nothing big is going to happen, it is just our name that is changing and here are the reasons why. Why are we changing from Piwik to Matomo? As projects evolve, so do names. After 10 years of Piwik and the amazing achievement of building the top open source analytics software that gives every user full control of their data, we are now looking forward to the next chapter. Thus, Piwik, the community project, will now become Matomo. The only change is our name, everything else stays the same. This will allow users to take a fresh look at what we’ve become today and acknowledging all of the community’s hard work over the past 10 years. In addition, we also want our name to be unique, ensuring that it is not shared with any other company to remove any possible confusion or affiliations. 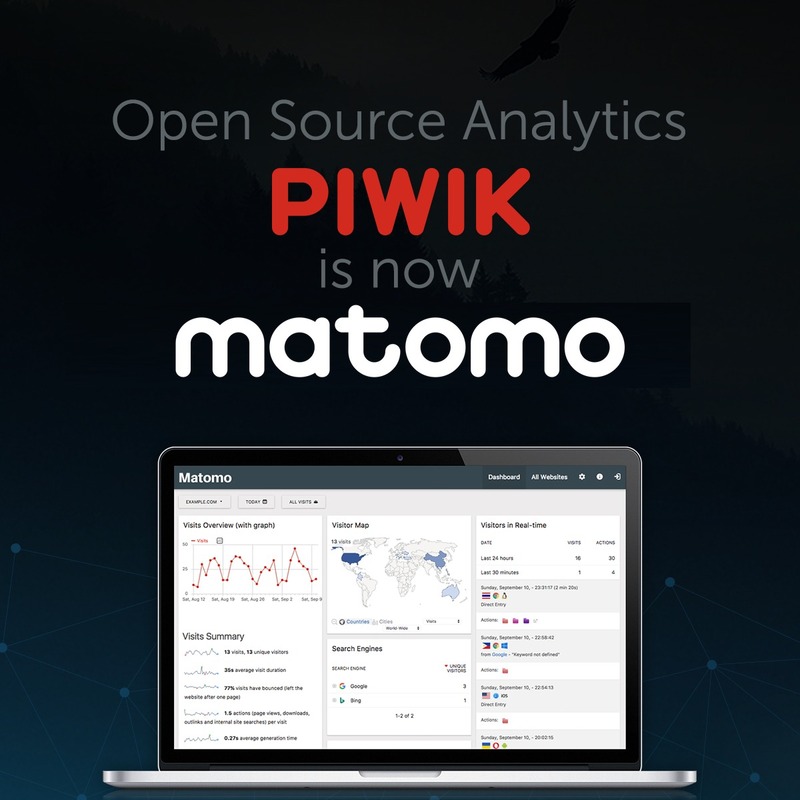 Piwik is already used on over 1 million websites and with Matomo, we hope to reach our maximum potential. With the strong focus on privacy worldwide and the upcoming privacy regulations about to be legislated in Europe, it is clear that we were on the right mission from the very beginning. With the upcoming big release Matomo 4.0 planned for this year, new privacy protections will bring users the tools to be compliant with the GDPR privacy laws. And Matomo will grow in line with these regulations, with a very clear and focused vision. Changing our name is an exciting opportunity for us, and we hope you love the name Matomo as much as we do. So what is going to change for me? Well, basically nothing, the name will change but the values stay the same: Matomo (Piwik) will continue to be free and always will be. Also the same people stay behind the project. We are motivated more than ever to take this project to the next level. Why not keep the name Piwik? For a few reasons, one of which is to ensure that Matomo does not/will not share its name with any other businesses unlike Piwik. We also want to protect the Matomo brand and for it to remain the open source community project name forever. Where does the name Matomo come from? Until we found Matomo! Easily pronounced in all languages. Short enough to remember. Concise. And best of all… Matomo means decent in Japanese. Which aligns with one of our key values – transparency. We love the name Matomo and hope you do too. What is the vision of Matomo? 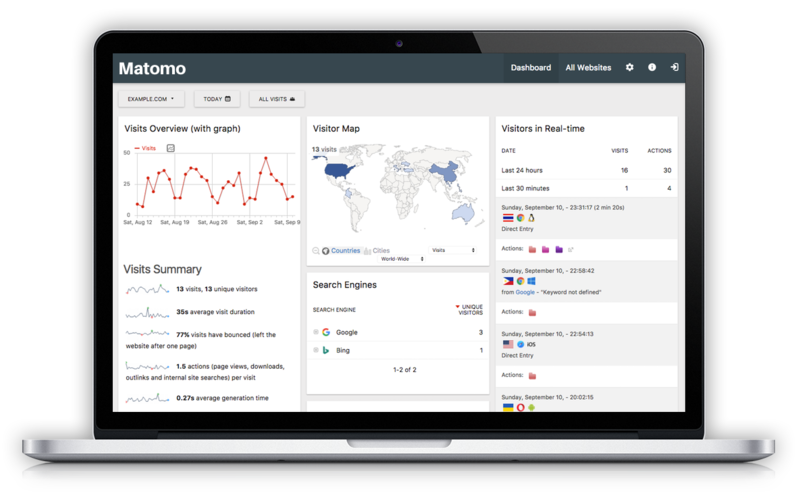 Matomo provides a range of amazing and innovative features, allowing you to get a 360 view of your visitors. These insights are invaluable to help understand behavior, keep track of goals, and increase conversion rates and revenue. Who will deliver Matomo professional services? Any company who wishes to. The only exception is that no companies will be allowed to have the name Matomo. Our company providing professional services is and will remain InnoCraft. Where can I follow the Matomo project? If you are already following us on social media, you will be kept up to date with Matomo automatically as all social media accounts will be redirected. How should I pronounce Matomo? Where can I see a demo of Matomo? Where can I download Matomo first release? Matomo is an internationally registered trademark of Matthieu Aubry, Founder of Piwik (now Matomo). What are the next big steps? We will keep it simple for our valued users. As it is just a name change, the only thing you will notice is that the Piwik brand will gradually be replaced on the websites you are used to seeing the name on. The first version of Matomo will be available in just a few days for download. The software version numbers stay the same: the next release after Piwik 3.2.1 will be Matomo 3.3.0. All our public HTTP APIs and Tracking SDKs will continue working normally. As you can imagine, there is a lot of work and complexity behind slowly updating all the SDKs and keeping backwards compatibility, so our renaming project will take a few weeks to complete. The Matomo trademark will later be transferred into the Matomo foundation, a non-profit that will be dedicated to promoting and ensuring access to Matomo and our related open source projects in perpetuity. Thank you for continuing to support our project, alongside our 20+ Matomo core team members and more than 500 contributors. Please help to spread the word about this announcement by sharing it with friends or or colleagues who may benefit from using Matomo Analytics!